With around 40% of adult men and 24% of adult women suffering from snoring, it’s generally considered a bigger problem than many realise. While there’s the obvious problem of disturbing partners and loved ones from their sleep, there are also some serious health impacts to the person snoring. Occasionally, snoring is entirely normal and besides disturbing those around you, it’s entirely harmless. However, if it happens night after night, it’s worth getting it checked, as it could be a symptom of a bigger problem and lead to further health risks, such as sleep apnoea, higher blood pressure, heart problems and more. Snoring is caused by some sort of obstruction to your breathing while you’re asleep, although the obstruction itself can be difficult to pin down. It could be something as simple as the position you’re sleeping in, the result of drinking too much alcohol, or a physical problem such as the uvula (the dangling bit at the back of your mouth) blocking the airway. While these are the most common, they are by no means the full story, so there may be some other reason for your snoring. Due to the number of possible causes, it’s worth visiting a dentist who’ll be able to help stop your snoring. Stop your snoring: is snoring dangerous? Generally speaking, no. If it’s only an occasional thing, or a one-off, it’s not worth worrying about. However, snoring is a major symptom of sleep apnoea, which can be hazardous to your health. Sleep apnoea prevents your body from getting the oxygen it needs when you’re asleep. This impacts the sleeping cycle, your blood, heart and brain functionality. While rarely fatal, sleep apnoea impacts your daily life as you’ll feel more tired, wake up with headaches and generally feel run down, with no visible cause. Can I reduce my snoring without visiting a dentist? While there are plenty of over-the-counter fixes to snoring, the results can be extremely inconsistent from person to person, as the root cause of your snoring in particular will be individual to you. 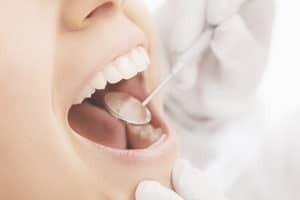 A dental care visit can help you identify what’s causing the problem and what sort of snoring treatment would be best to use; whether it’s over the counter treatments, a shift in sleeping positions using specialised pillows, or a change to your lifestyle. Generally, once the problem is identified, finding a way to stop your snoring is relatively easy. 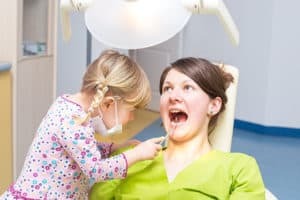 Can dental care and visiting a dentist help me? Yes. While many choose to visit their GP to find a solution to snoring, a dentist is more specialised in oral health and can identify the issue by surveying the shape of the mouth and looking at your lifestyle. While not a perfect fix, anti-snoring sprays are ideal for occasional snorers who want to reduce the interruptions to their partner’s sleep, or who want a better night’s sleep. For those who snore more often, other treatments are recommended. Sometimes, snoring is the result of nasal airways being smaller during sleep. Nasal strips and dilators expand the size of these airways, making it much easier to breathe while you’re asleep, preventing snoring and helping your body get the oxygen it needs to rest properly. Looking like a mix between mouthguards and braces, mandibular advancement devices (or MADs) subtly adjust the positioning of the lower jaw, opening up the airway at the back of the throat and leading to less snoring. Allergies such as hayfever, bed sheet materials or even certain washing liquids can cause snoring, as the nasal cavities become blocked as a reaction. It may be worth going through an allergy check to see if this is causing an issue with your sleeping. Our veneers give you the look you want without damaging the tooth.